The core concepts of investing are shockingly simple and could allow you to retire years early. Learn about diversification, taxes, asset allocation & more. 15 min read. Financial Independence, Investing. Leave a comment. About 10 years ago my mom passed away. It was easily the toughest time in my entire life. I’d just graduated college 2 months before, and suddenly I was managing her estate while working full-time and commuting back to St. Pete to do repairs and sell my childhood home — all while trying (usually unsuccessfully) to collect money from a tenant living on her property. During this time I learned a lot about how to manage money — often by making mistakes. I realized at the time that I knew next to nothing about investing, or how to manage money. How to budget and not go into debt is one thing, but knowing how to save and invest is a completely different learned skill. With many ways to approach this, it can be more than a little confusing. It’s also scary making a huge deposit of your hard earned cash into somewhere new — hoping that you’re making the right choice. After more than a decade of managing my own investments (with respectable returns), I wanted to share what I’d learned, but also open myself up for advice on what’s mostly been a process of personal learning. Sadly, some of the best education comes from trying things and learning, but there’s a lot that can be read beforehand. The goal is to get to a point where you can understand the terms you’ll see when investing. 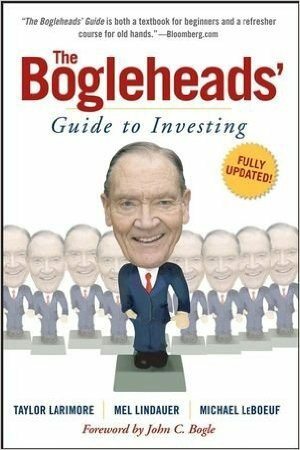 I always point people towards the same book — Bogleheads Guide. This isn’t a book about doing some hot investment method, but one about how to save and invest money for the long term while reducing taxes and riding things out when returns get rough. Here on Minafi, I created a free 10-week Minimal Investor course to help go over the basics of how to invest from scratch.Do you want to learn how to be a Minimal Investor? Sign up to start the course today. Another great site and fellow Orlando startup is Edukate, Simplified Financial Education to Help Steer Your Retirement. If you’re looking for videos, they’re a good place to stop. There are a few terms that just knowing about can help understand how to manage your investments. My recommended way to invest is to use a simple three-fund Vanguard portfolio. Just saying that though, doesn’t do justice to the why – which takes a lot more explanation. Much of the rest of this post is understanding why this works and I recommend it. So what can you invest in? Usually, this comes down to stocks and bonds — but there are a few other categories as well. Stock — Owning stock is owning a very small piece of a company. It’s usually high risk, low diversity, low fee. You won’t have to pay any ongoing fees (aside from a small purchase fee with your stock brokerage perhaps). Direct ownership in stocks makes up less than 5% of my investments, and are the most volatile. I wouldn’t recommend investing directly in stocks to anyone, ever — aside from a small portion in companies you believe in. Bonds could be from many places including companies, municipalities, international companies, locations or the treasury. Bonds Funds — The idea behind bonds is that companies need money, so they sell bonds promising to repay them with some interest. You could buy a bond from a specific company, or a municipality, but most people don’t do that. Instead, you’d buy a bond fund — a collection of bond purchases from various companies. This means that if one company fails, you don’t lose all of your money. ETF, Exchange-Traded Fund — These could also be called mutual funds. These are single funds you can invest in which are a collection of stocks and bonds, grouped together to avoid risk. If you ever see the DOW or Nasdaq index, those are a collection of funds used to represent the market as a whole. Since these represent a number of companies, if one company goes out of business, it won’t have a huge effect on your investment. These make up 95% of my investments and have a very low fee associated with purchases and holding. This isn’t everything of course. There are REITs (Real Estate Investment Trusts) which allow you to invest in property without owning it. There are commodities — investments in materials like gold. Not to mention sector investments. These are things like investing in “energy”, or “health care” with the assumption those will be hot. Stay away from Active Managed Funds when you can! Active Managed Funds — These are variable risk, high diversity, high fee. These are a collection of stocks where a human picks out what is in it. Because of the human element, these have a higher volatility, as well as higher fees that are used to pay the people that work on them. I’d recommend staying away from these except in the case where you want exposure to a different sector to add diversity to your portfolio. This, to me, is the same as going with an advisor and putting your trust in them — or picking a stock because you trust the company. These can charge up to 2% of your total invested amount as a fee each year — or $200 per $10,000 invested per year. Index Funds — These are funds that are controlled by a formula. For example, Vanguard Total Stock Market Index is the biggest fund in the world and is an index fund. These have the smallest fees of anything and can be as low as 0.04% — or $4 per $10,000 invested per year. Expense Ratio — When you see any fund, it’ll probably have an expense ratio listed. For instance, American Funds Growth Fund of Amer A has an expense ratio of 0.66% or $66 per $10,000. That’s 15x the expenses for VTSAX. For both Active Managed Funds and Index Funds, you won’t ever get a bill for the expense ratio. Instead, it’ll be reflected in the price of the fund. In other words, if there were two identical funds with different expense ratios, after a year the one with the lower expense ratio would be trading slightly higher. Load — Load is probably the scariest fee of all. I learned about it when a financial advisor put some funds of mine in a fund that had a load without my knowledge. AGTHX has a load of 5.75, while Vanguard Funds have no load. So what is load? Load is a fee that the investor pays to compensate the sales intermediary (the broker, financial planner, investment advisor, etc) for their time and expertise in selecting the fund. There’s a concept of “front-load”, where the fee is paid when the fund is bought, or “back-load”, for when the fund is sold. My advice is that if your financial advisor ever suggests, or you find out you’re in a load fund, then you need to fire them and get out. If you have gains in the fund, I’d wait until you’ve held it a year — but also make sure not to reinvest dividends during that time. On that $10,000 purchase of AGTHX, there is a 5.75 front-load, meaning that the investor is paying $575 for the privilege of investing in American Funds. $575 + $66 = $641 a year for AGTHX vs $4 for VTSAX. Crazy right? It’d be awesome if AGTHX outperformed, but it doesn’t. For the most part, similar funds in a category will perform about that same. Year to year bond taxes. 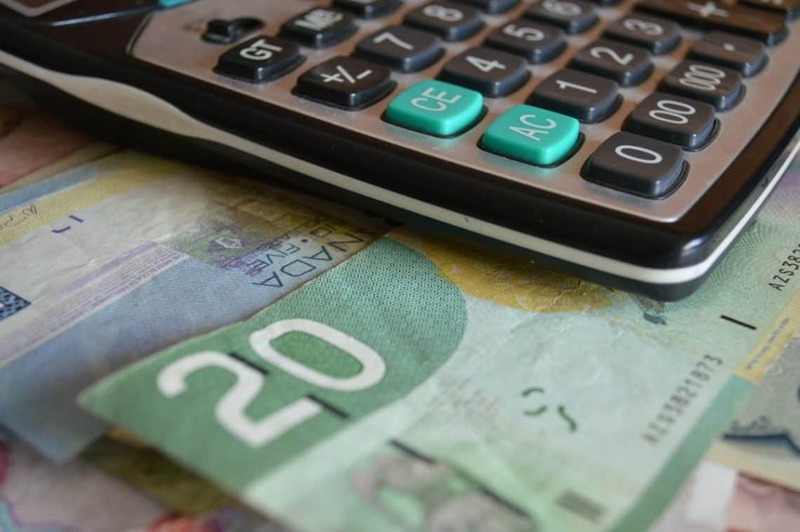 If you have investments in bonds or funds that have a yield (which is almost everything) and these funds are held in a taxable account (so not an IRA or a 401l) you’ll need to pay taxes every year on these dividends. These will be taxed at your current tax bracket — just like any additional income you make. The better you can do to move these into a tax deferred or tax exempt account the better. Short-term capital gains taxes are paid each year on the gains made selling funds that you held less than 1 year. You’ll pay whatever your current tax rate is. So if you’re in the 28% tax bracket, you’ll pay 28% tax on your capital gains. For example, you invest $10,000, and 6 months later sell for $12,000. You’ll pay 28% of $2,000 in taxes, or $560 in taxes. I try to never sell anything in the short-term category unless it’s at a loss. I don’t buy anything I wouldn’t hold forever. Long-term capital gains taxes are paid on capital gains of funds held longer than a year. For these, you’ll pay either 0% (if you make 0–36k or 73k married) or 15% (if you make 36k+/73k+). A trick of this is that if you can lower your income below 73k for 2 people, you could live off investments tax-free. Like short-term, this tax is only on the gains, so in the same $10,000 invested, selling it for $12,000 1 year later, you’ll likely pay $2,000 * 15% = $300 in taxes if you make $36k+. Choosing where to put your investments (401k, IRA, Roth IRA, Brokerage) will have a major impact on your taxes as well — potentially costing years of income if chosen incorrectly. It’s worth reading about the Principles of tax-efficient fund placement to help decide where your funds should be invested. The Bogleheads Wiki is a great place to explore. Ok, so why should you manage your own investments rather than letting someone else do it? They’re professionals with years of experience in this field after all, and you might not have that confidence. Well, the secret is that next to no one beats the market, and a statistically insignificant number of people (near 0) beat the market for years in a row. Honestly with any of the Bogleheads Lazy Portfolio’s put in the right tax efficient locations you’ll do better than almost any financial advisor. Interest only advisors charge a fee for meeting them. If you chat with one, these are the kind I recommend. Percent fee-based advisors will charge a percent of the money under management per year — often tiered based on how much you have. Usually, this’ll be between 0.25% and 1.5%. This amount is often paid quarterly. Some advisors will charge a percent of the transaction, which may be 1% or so. Every time you change funds, they’d change this. All of these fees are bad, and can seriously add up. Financial advisors need to beat the market in order to make money for their clients. Some years they might, but unless your name is Warren Buffett, I’m not going to have enough faith to sign my funds over. One of the things that get a lot of attention is trying to get a good “asset allocation” — how you divide things up between various buckets. It’s easy to get sucked into investing in the current hot market. When I started investing in international funds — but if you look at international since then it’s been near the bottom. 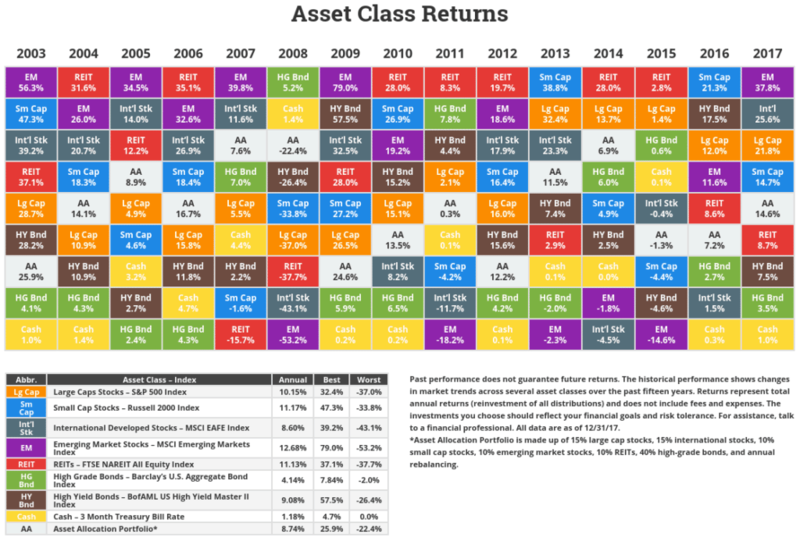 One way of visualizing this over time is ordering all asset classes by their returns over time. Here’s an amazing (and up to date) version of this from The Novel Investor that illustrates an important point — it’s hard to pick winners. Take the S&P from 1995–1998; this was during the dot-com boom. Things were doing amazing for a few years. Not so much for 2000–2006. If your portfolio was diversified, with some assets in each class, your overall performance would be closer to the middle (or more likely slightly above). That’s the goal of diversity. If you’re curious what my allocation looks like, it’s nothing too interesting. 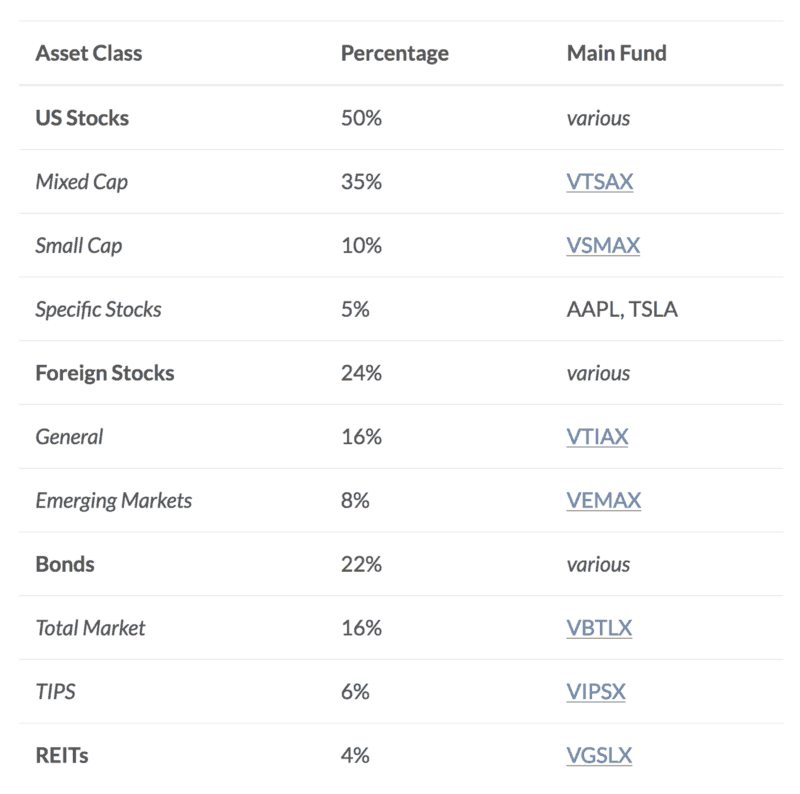 It’s almost entirely Vanguard funds and looks similar to what you’d get if you used a service like Betterment or Wealthfront. For me, the gambling part comes into place in that “specific stocks” category, which allows me to try to pick winners. Over the years I’ve picked some good ones (AAPL and TSLA are up more than 100% over the years!) but I’m smart enough to know that makes me lucky as opposed to good. I’ve also made bad picks — LUV at the wrong time, Vanguard Energy fund before oil went way down (although I have liked that change). Rebalance assets every year by investing more into areas that are below the target percentage. Not many rules, but it’s been enough to keep me from making big mistakes. These are great services, but they are still very new. Who knows if they’ll be around in 10 years. My recommendation is to invest in things yourself so you’ll have the most control. Learning a lot allows you to make changes easily as well. If that’s still too much, there are a number of new services that have sprung up recently that handle this in a way that’s actually better than an in-person financial advisor could. Betterment and Wealthfront are leading the way here. These take all the advice I follow and automate the investing process. They also sell your funds and buy similar ones in order to take advantage of minor tax advantages that can add up. These services will charge about 0.15% to 0.35% for their services — which is still significantly less than active advisors. There’s a lot written about robo-investors — almost all good, but a few bad. The easiest thing you can do if you want to get started is max out your 401k to the company match, then open up a mutual fund account at Vanguard. You can open up a Roth IRA (or a traditional IRA) and throw $5,500 a year in there to grow and learn with. Vanguard has one minimum, $3,000, which you’ll need to get started. After that, it’s easy to add any amount as an auto-deposit each paycheck. There’s a great post on Mr. Money Mustache’s Blog about this one. The simple answer is as much as you can. If you can save 50% of your income, you can retire in 17 years. Raise it to 75% (either by reducing expenses or saving more) and you can retire in 7 years. So you’re ready to give it a go. The best way to keep track of things that I’ve found is Personal Capital. Some people swear by Mint which is also awesome. I think Mint is better at budgeting and general day to day transactions, while Personal Capital is the favorite when it comes to investing. Either one of these will work. Maybe this should’ve been higher, but I’m no expert in this stuff. I’ve come to realize that even the “experts” usually aren’t either. I’d consider myself more of a pragmatist, who has found a system that works well for me — but that doesn’t mean it’ll work for everyone. If any of this interests you, and you’d like to chat, feel free to leave a comment. Since this is a more personal subject matter if you’d rather chat just us, feel free to use my contact form.